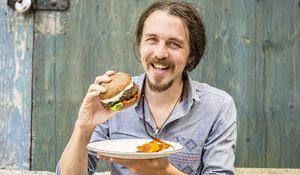 Dynamic about vegan food without being preachy, Lee Watson is the man set to revolutionize the way we think about veganism . With his debut cookbook Peace and Parsnips out now, we caught up with the man himself. Can you tell us a bit more about your book Peace and Parsnips? It’s a chunky slice of vegan vibrancy; packed with colourful plant based dishes that will appeal to absolutely everyone. There are recipes here for every occasion and every taste. 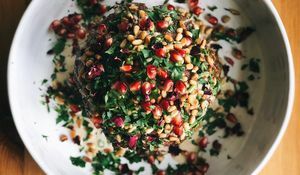 Vegan food takes a fresh and creative approach to cooking anything from burgers and bangers, to luxurious curries, creamy soups, hearty bakes, zesty salads, funky nibbles and a whole host of gorgeous drinks. The dessert section is packed with richness and decadence and also loads of healthy sweet treats. I wrote the book with my friends and family in mind, who are mainly rampant carnivores; they regularly gobble up the recipes and loved ‘em! 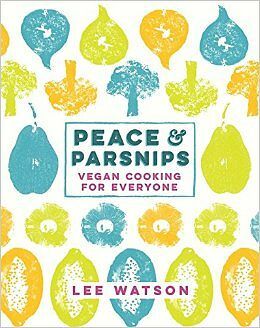 ‘Peace and Parsnips’ shows that veganism in primarily delicious and secondarily, brilliant for you and the plantet. If you had to pick one recipe to show off what Peace and Parsnips is all about, which one would it be? I think there are quite a few corkers in here, but the ‘Pecan and Portobello Mushroom Burger’ is a real hit. Carnivores and vegans alike rave about it. It even looks like a normal burger and has fooled many, it has an intense taste and is super rich and flavourful. Vegan food is always surprising; it feels so fresh and new, even though the term ‘Vegan’ has been around since the ‘40’s. Veggie burgers have a bad rap for good reason; they are generally not the best. In ‘Peace and Parsnips’ I’ve really focused on making the burgers something special and to top it all off, they are very, very healthy! It’s a win, win thing. What advice would you give to someone looking to cook vegan food for the first time? There is really no great difference in cooking vegan dishes, except that they are roughly a third of the price to shop for! I guarantee that if we went into your kitchen together, you’d have all we needed to make a vegan feast. There are generally a few more ingredients to play with as we can’t just rely on meat or cheese to give us flavour. We are drawn into creative corners and this leads to all kinds of wonderful new things. With just a few key ingredient switches and a focus on glorious vegetables, fruits and legumes, you’re well on your away to becoming vegan. The possibilities in a well-stocked veg basket and a handful of cashew nuts are endless. Having an open mind to trying something new is key. Do you come from a long line of great cooks or are you the first passionate foodie in your family? Here at The Happy Foodie, we're somewhat obsessed with cookbooks. Can you tell us a bit about your favourite? I’ve only recently been buying cook books; I used to just pick recipes up like a happy magpie, scribbling them into my notebook in libraries or book shops. I was given Oh She Glows recently, a brand new vegan cookbook from the US. Its one of those books that you want to cook every recipe right now! Its gorgeous. There are actually so many inspirational vegan cookbooks from the US; it really is a hot bed for very creative cooking (which happens to be plant based). The 'Veganomicon' by the brilliant Isa Chandra Moskowitz is a massive hit state side, but then again, all of her books are interesting. Hopefully 'Peace and Parsnips' can bring a British/ European take on all things vegan and veggie. It’s a style of cooking that is evolving very quickly, always looking to the future. Who would be your dream dinner party guest and what would you cook for him/her? I would say the Dalai Lama, but he likes early nights, so it would be Robert Plant who just lives a few valleys away up here in North Wales. I’d invite him around for the Kashmiri Turnip Curry with Beetroot Raita (in the book). Then we could have an after dinner sing song around the fire pit with some spicy chai’s. Is there an ingredient you are really enjoying cooking with at the moment? I was cooking loads of plantains recently in South India and I love their versatility. Mashed, fried, roasted, boiled...always delicious. I also love turmeric, its tastes like a peppery orange, crossed with some ginger. It seems to sneak its way into far too many of my dishes and there is no mistaking it! It has some supreme health giving properties; it's a very, very powerful anti-oxidant. Really things like turmeric, cinnamon, ginger, coriander etc. are more like medicines than simply food. Potently wonderful foods. Try adding a teaspoon to a smoothie. Quite a transformation. I also love flax seeds. I think many vegans do. They are miraculous little pockets of radiant nutrition. They are ridiculously high in fibre and omega 3 fats and are packed with anti-oxidants, even higher than things like blueberries. Ground up, they can be added to bread or cakes, or easily sprinkled onto cereal or to thicken stews. I love 'em! What excites you about the British food world at the moment? Its openness, diversity and creativity. We are well placed, having one foot in Europe, so we are grounded in many old and brilliant food cultures, but are now freely spreading our wings to the farthest reaches of the globe. British food is not dogmatic and we are open minded to new flavours and ideas. I think that's why Britain produces so many brilliant chefs. With the internet and more options to travel around, Brits are becoming well versed in all sorts of magical and remote food cultures. The British food world is a vibrant kaleidoscope of global flavours and influence, the restaurant scenes in our cities and towns reflect this. There is never a dull moment and vegan food incorporates this enthusiasm with a positive ethical and environmental twist, as well as whole new dimensions of deliciousness. 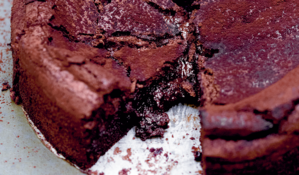 After a gorgeously indulgent baking recipe to make someone (or yourself) swoon this Valentine's Day? We've rounded up 10 delicious recipes that your Valentine is bound to fall head over heels for.